every time i watch lilo and stitch i dream of returning to hawaii. i love hawaii. the casual culture, the sun, the sand, the surf…..the pineapple! thank heavens costco gets me my pineapple fill. if you love pineapple, grilled chicken and teriyaki sauce, these sandwiches will be a favorite in your family. alooooooooha! Place in a large Ziploc bag. Combine Teriyaki sauce and brown sugar until sugar dissolves. Add 1/2 of the mixture to the bag with the chicken and seal tightly. Place bag in refrigerator for at least 4-5 hours. Separate remaining Teriyaki mixture into 2 separate bowls (to prevent cross contamination use 2 separate brushes too)– one for the pineapple, one for the chicken. Open pineapple can and save a little of the juice in a bowl. Place chicken and pineapple on the grill (medium heat). Brush with Teriyaki sauce every few minutes until chicken and pineapple are done– try to only flip the chicken and pineapple once. Either on the grill or in a frying pan, cook ham with a little of the pineapple juice until it becomes nice and hot. Slice open hamburger buns and place a piece of cooked chicken on each bottom bun. 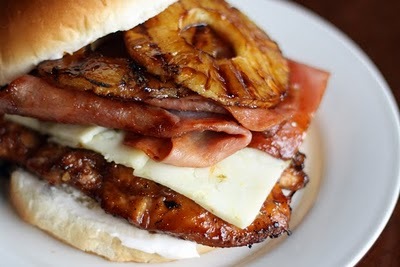 Top with cheese, ham, grilled pineapple, and bun top. Serve immediately with remaining grilled pineapple. Serve with pina coladas and dream of a secret beach on kauai!